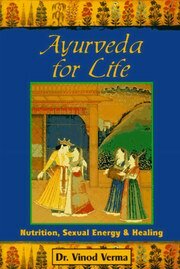 Ayurveda for Life is a practical guide for using Ayurvedic concepts to nourish the body, nurture sexuality, and balance body and mind for healing. Dr. Verma explains how the food you eat, and how you prepare it, relates to both sexual energy and healing. This book contains dynamic material; how to use spices, just-plain-good vegetarian recipes, and some very special aphrodisiacs, all brought together with Dr. Verma's own balanced, professional, but vibrant voice. she explains the three humors (Vata, Pitta and Kapha) in relation to the qualities of mind (Sattva, Rajas, and Tamas) and the importance of balancing these qualities for good health and sexual fulfillment. Food can also be used to correct sexual problems. Dr. Verma teaches how to channel mental, spiritual, and sexual energy into healing energy. If you want to live a sensuous and emotionally fulfilled life, her philosophy of a gentle but joyous compassion for all life will surely be an inspiration! Dr Verma shows how nutrition, sexual energy and healing are inextricably linked, and discusses foods commonly available to Westerners and how they can be used to enhance sexual energy and solve sexual problems.